Innkeepers and small business owners can no longer rely on “JUST” their Website and/or Traditional Online Marketing Tasks to deliver the same ROI (Return on Investment) results at the same financial level (Revenue) that these Foundational Steps were capable of producing in the past. These Foundational Steps must still be in place. 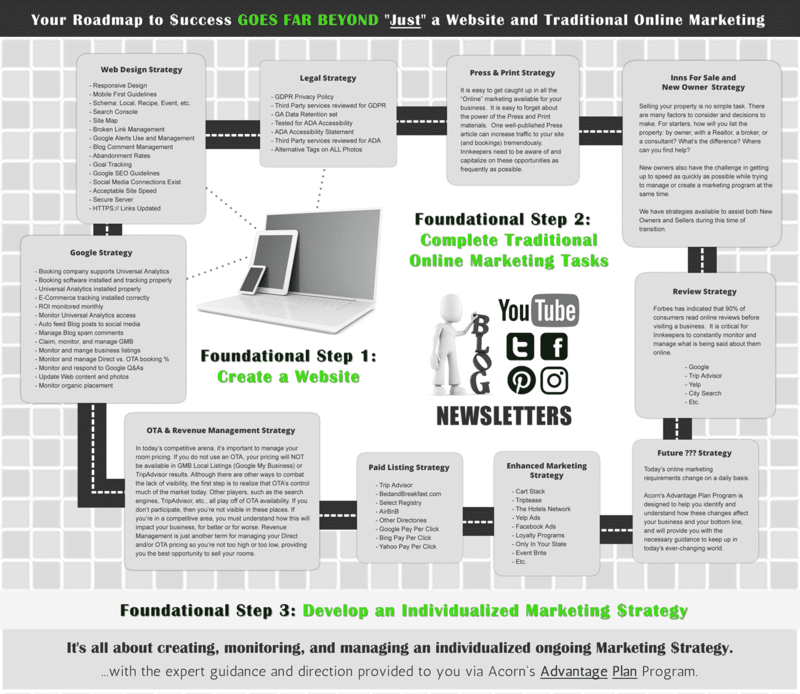 However, if you want to succeed in today’s online world, you must develop, create, monitor, and manage your own individualized Strategic Marketing Plan on a monthly basis. The plan must successfully implement the items listed on the info-graphic roadmap below, and also stay current with any new items that will occur in the future. Without such a plan, you will not be able to maintain and grow your revenue as our online landscape continues to change on a daily basis. If you’re not keeping up, or don’t even know where to start, we highly encourage you to join our Advantage Plan Program ASAP. Acorn Internet Services is the industry leader when it comes to understanding what’s affecting our Innkeepers’ bottom line. With access to our expertise and guidance, you’ll know exactly what you need to do to stay current. When you subscribe to one of Acorn’s Advantage Plan programs below, you are paying to receive and have access to our continually updated Expertise and Knowledge so you can manage and grow your business without making costly and detrimental mistakes. *Acorn no longer hosts websites built by other companies. If you wish to subscribe to our Advantage Plan Services, but are not hosting an Acorn Site with us, ask about our Advantage Plan “Lite” Pricing. Who should choose Level 1? A Hobby or Lifestyle Inn that still needs to produce ongoing revenue or a non-lodging client that wants to stay on top of any items related to their specific online web presence. Who should choose Level 2? Any Innkeeper or business owner who wants to manage their own marketing strategy, without monthly hands-on assistance, but also needs to be aware of changes impacting their individual business structure. Who should choose Level 3? Any Innkeeper or business owner who wants expert assistance with monthly monitoring regarding their online marketing strategy, including hands-on assistance, phone calls, revenue tracking, planning, and review. Who should choose Level 4? Any Innkeeper or business owner who wants traditional online marketing services, in addition to expert assistance with monthly monitoring regarding their online marketing strategy, including hands-on assistance, phone calls, revenue tracking, planning, and review.